When you talk to owners of the race Mangalarga Marchador or you occupy yourself with the literature - either in the country of Brazil or the countries of Europe – what unites the owners is the general love of the race because of the beauty and elegance of the animals as well as the distinct gentleness and human reference of the horses. First, it is not very productive, to compare the "Marcha" with the "gait" of the Iceland horse, because the repertoire of Mangalarga Marchador is far too varied and at the end also significantly independent. The “Marcha” should correctly be counted to the higher ranking definition of the four-stroke gait, because that is certainly the common denominator of all gaited horses. Does the Marcha replace the trot? Are there MM who offer the pure gait as well as the trot? Can/should a MM be ridden at a trot at all? Counter-question: What contribution to enjoying our horses should be given by finding out the "truth" to all these or similar questions? Is there a one and only answer? Without a doubt, the rules of the breeding statutes of the ABCCMM (MM Brazilian Association) confirm, that trot in MM is not desired, and a registration in the studbook is not accepted if a MM does not offer Marcha but only trot. It cannot be overlooked that some MM imported to Europe quite unmistakably provide a clear trot besides the Marcha, if the rider allows or conducts it. Unstrittig ist schliesslich auch, dass die Evolutionstheorie der Gattung der Pferde belegt, dass sowohl der Trab als auch der Rhythmus der Gangpferde bereits vor der Entdeckung diverser Kolonien im Süden oder Norden unseres Globus - genetisch bedingt - bekannt waren. Bereits der mittelalterliche Begriff „Zelter“ bezeichnet die Fussfolge der Gangpferde und soll als Beleg erwähnt werden. Eventually, there is no doubt that the theory of evolution proves, that the species of horses was able to trot and had the rhythm of gaited horses – genetically determined - long before the discovery of various colonies in the south or north of our world. Even the medieval term "Zelter" means the foot sequence of gaited horses and is to be mentioned as evidence. It is also historically documented and hardly called into question that it was the temporal circumstances of the society (the role of the horse in carrying people, industrialization and development of the automobile, horses for transportation in war, in agriculture, aims in equestrian sports, etc. ), which in horse breeding preferred the trot in contrast to the foot-rhythm of gaited horses or vice versa. Brief Excursion: The list of horses that should have, according to breeding standards, a pure trot heritage and nevertheless offer gait-rhythms is confusingly long. • each of which is interrupted by triple-supported walking sequences. 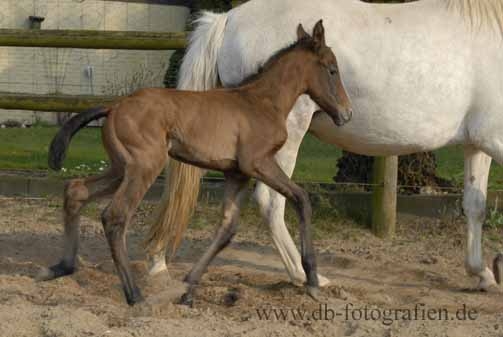 As a breeding result, the Marcha does neither include a one-foot support, nor a flying phase, which should point out again that a comparison with the gait of Iceland-horses is wrong. A common optical feature, often pointed out in the Marcha is - in the side view – when the front legs change foots steps, they describe a semi-circle. A more elaborate sequence of movements is not provided in the regulations of breeding, because that would have a negative impact of the stamina in endurance rides. Due to this, the Brazilian breeding regulations do not ask for any more spectacular movements of the front legs. This semi-circular arrangement of the front legs at the step-change is also considered one of the reasons why a Mangalarga Marchador is so comfortable to ride, because the steps of the front legs are particularly elastic and soft during this movement. • the ground cover is larger in Batida rhythm and hence the frequency of alternating different foot-sequences lower. • the result can be heard acoustically: a short, echo-like double tact. • In side view, a perfect "M" formation of the legs can be identified, if you catch the right moment. • Batida horses tend to move more regular and steady. • for (simple) dressage exercises, they are usually more convenient. • the step length is shorter and thus the frequency of the alternating foot sequences higher. • this causes the acoustic four-tact to be heard more quickly, yet much more regular, rhythmic and steady. • Also here, small rocking movements can be seen, but are rather in a "right-left" pattern. • This variant is particularly popular because vertical movements of the rider are almost completelyavoided. • The picada horses can change into gallop a little more difficult. (Four-beat canter). Any efforts that can be summarised under that name, have the same aim: combine the step range and the rhythm of the Batida-horses with the full convenience of the Picarda horses. It should be noted that the above written phrases represent only an ideal description in theory. The reality shows that each Mangalarga Marchador has numerous variations of showing its whole repertoire of gaits. The ranges are floating and sometimes even dependent on the "daily personal condition" of horse and rider. As a result, it is not so much surprising, that some Mangalarga Marchador are offering both techniques. More than that, an experienced breeder/rider may succeed in alternating - at least from Batida to Picada. Regular exercise and experience of the rider will help the horse to minimize its deficits (should they appear as such) and to build up and promote its talents. 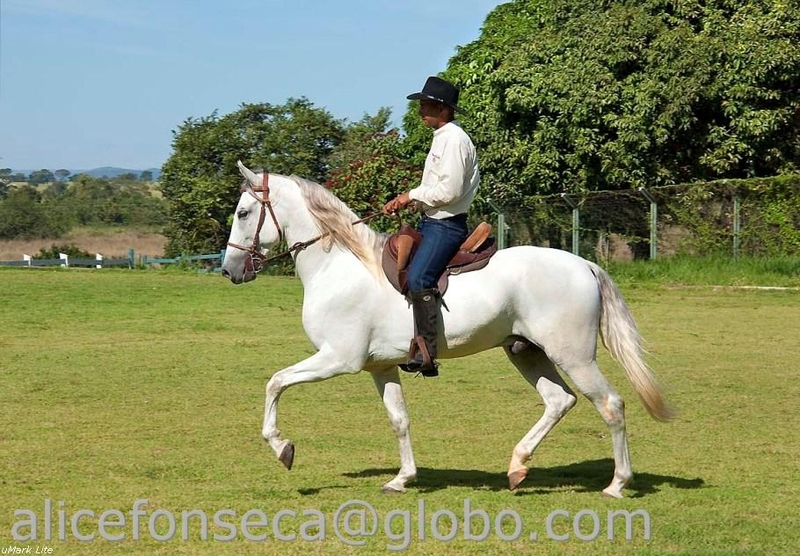 Of course there are stories in Brazil that breeders train their noble pieces only in the oval track on Marcha and get sometimes nervous when a prospective customer wants to try a gallop. Nor can it be denied that on the other side of the Atlantic not all training methods for Mangalarga Marchador could be called to derive from the high school of riding. But in Europe we also do not want to bet that Horses are caressed 24 hours a day. 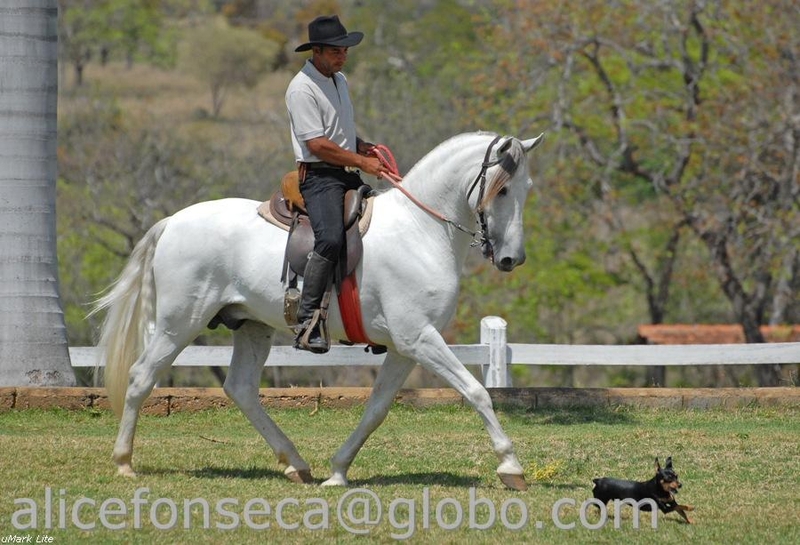 More interesting is, that in Brazil there is an increasing number of breeders, who employ trainers – often from trotting races - to enhance daily subjects like suppleness, assembly, dependence and of course permeability. Many winners of various competitions in Brazil today are being prepared by professional coaches for the victories. Which horse, unless a Mangalarga Marchador, the "horse without limits" (Cavalo sem fronteiras) should not also be a talented partner for friends of dressage or jumping competitions? The time has more than come to deal with these issues without dogmas. When even today the annual Brazilian final championship, the "Prova funcional" (combination of obstacle, jumping, speed and dressage exercises) can tip the scales, whether a horse which was qualified for the finals emerges as the winner or barely gets one of the ranks, it has to be acknowledged in Europe that our race Mangalarga Marchador may not provide Olympic candidates but maybe the next winner in i.e. the next Working Equitation season. Nobody is a better or minor animal lover or connoisseur of the breed, if one wants to take part in sporting competitions, and others are at the same time keener on prefering reinless or bitless riding. The association EAMM represents a degree of tolerance, which will combine all the represented directions and philosophies. As long as the rules of horsemanship are respected, and horse as well as rider can indulge in their pleasures, their efforts should be tolerated. EAMM wants to be an organization that is ready to assist if assistance is required, but would also be free of indoctrination. This is the idealistic aim for all supporters of the race Mangalarga Marchador.